Pianosa Island, known since antiquity as Planasia, is totally flat. 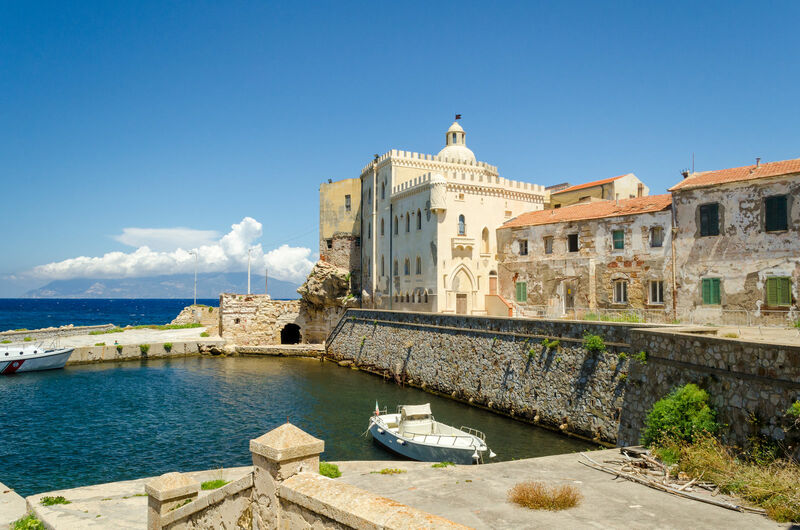 The closest island to Elba in the Tuscan Archipelago, Pianosa was already popular in Roman times, as testified by the underwater archaeological relics that confirm its presence along the trading routes of the classical Mediterranean. In the Middle Ages, Pianosa was contested by Pisa and Genoa until the late 14th century when it passed under Piombino rule, without ever managing to be permanently colonized. Pianosa later became a penal colony, as instituted by the Grand Duchy of Tuscany in 1856 and remaining as such until 1998. When the prison closed (it was separated from the small town by a large concrete wall), the Campo nell’Elba council and the Tuscan Archipelago National Park drew up plans to protect the environment and promote the island with its crystal-clear waters and unique attractions. The fact that the island was home to a prison for many centuries enabled the total preservation of Pianosa, whose marine environment brims with life like nowhere else in the Mediterranean. The coastline of Pianosa alternates between rocky stretches and beautiful sandstone bays – the best known is Cala San Giovanni (or Cala Giovanna), a striking white sandy beach where bathers can wonder at the remains of a Roman villa. The island’s seabeds are blanketed in a lawn of seagrass, saved from savage anchoring and fishing trawlers. Snorkeling in the island’s waters is an unforgettable experience, a chance to observe groupers, lobsters, bass, snappers and moray eels and many more Mediterranean species in shallow waters. In 2013 the national park launched the opportunity to go diving near Pianosa thanks to a partnership with qualified divers. Only a few people can experience underwater sports here as there’s a cap on numbers, but for the special few it’s a way of exploring some of the most pristine seabeds in the Mediterranean. Pianosa offers more than just nature. On the island you can check out the countless traces of previous settlements dating back to prehistoric times, including a Copper Age burial ground, a Roman villa and Early Christian catacombs. To find out more, head to the Casa del Parco at Villa Literno. Visitor numbers are restricted to 330 people every day.